At Izzy’s Rental, we pride ourselves in being very customer oriented, with a reliable staff and a service you can count on. We have been renting jobsite, party, wedding, and event equipment in Bloomington and Indianapolis Indiana for almost 20 years. Putting together an event can be a stressful experience and getting every detail just right is important. 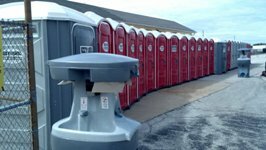 Let us put your mind at ease with our clean, reliable restroom rentals. We are experts in Equipment Rentals Indianapolis Bloomington Indiana. We are very attentive to the needs of each customer and want you to feel confident with our products and our prices. If you have any questions or concerns about our portable restrooms, please feel free to call us, or email us anytime, and we will be happy to speak with you. Izzy’s Rental is proud to service Indiana events, as well as job sites. If you need to rent portable restrooms, you need to contact Izzy’s Rental today. “My name is Debbie Wallace. I have a horse camp and use Izzy’s port-a-lets. They are nice and clean and always on time to keep them that way. When they say the are ‘wiping out the competition’, they mean it! Izzy’s price is better than the others too. Good product, good price, and great service!! We pride ourselves on expertise in Equipment Rentals in Indianapolis and Bloomington Indiana.